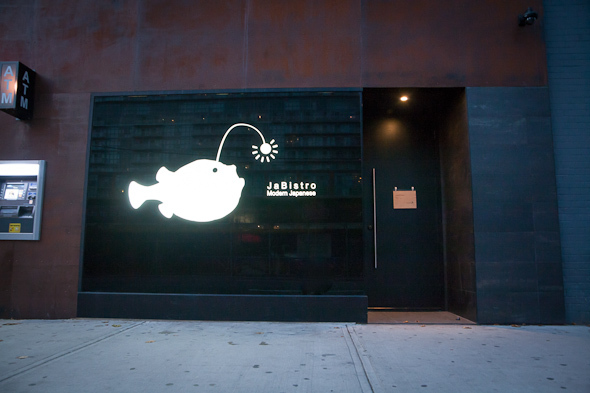 JaBistro opened three weeks ago in the Club District and is announced by a playful, illuminated front sign against blackout windows. At its helm is James HyunSoo Kim, who also opened the Guu chain of restaurants and Kinton Ramen , and chef Koji Tashiro, whose resume stretches from Tokyo, to Vancouver, to Guu Sakabar . 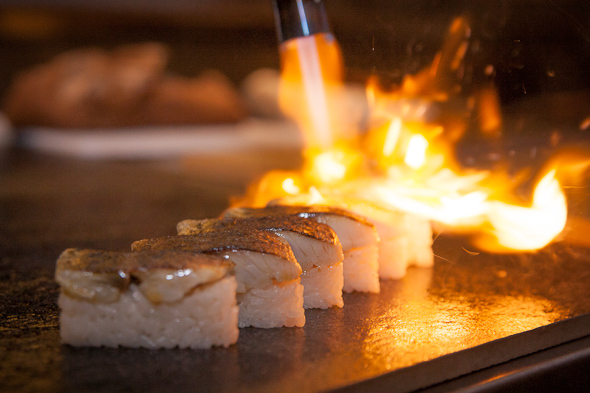 Tashiro's passion is clearly sushi, and he humbly admits that his time at Guu allowed him to familiarize himself with Toronto's culinary tastes. 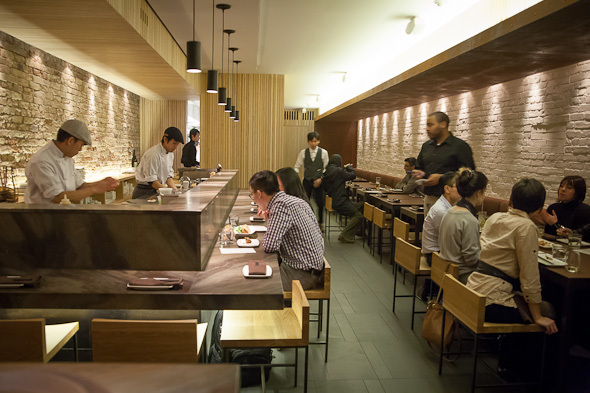 Inside, you'll find a bar area at the front, followed by a narrow dining room comprised of both table and sushi bar seating. Blonde wood and exposed brick are dominant throughout, and similarities to the Guu look are thanks to Bennett Lo, who oversaw the design. JaBistro's bartender, J.R. Graham, has worked extensively with the Publican Group in Melbourne, as well as recently at Parts & Labour , and was more or less given free reign behind the bar. The result: a succinct list of 5 cocktails and 3 virgin drinks. 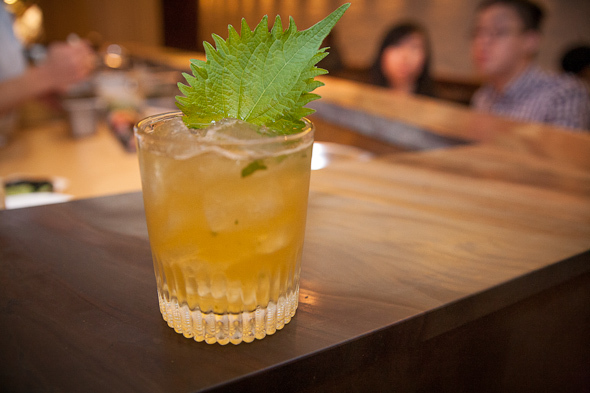 "Looking at it now, it's a deeply personal list," Graham tells me, but also one that's designed to function well with the food--as with the unusual Spicy Celery Lime (sake, ginger syrup, lime, celery bitters and soda, $11) or the Shiso Smash (bourbon, simple syrup, shiso, lemon and water, $13). You'll also find Flying Monkeys Amber Ale ($6), a selection of barley and sweet potato shochu, and sake on offer. We begin with the decadent sashimi platter (priced between $50-$100). Advance reservations are required for customized platters, and the price will depend on what you choose. 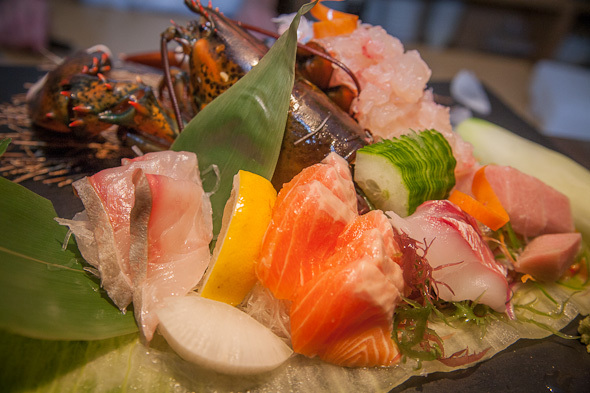 The sashimi on offer varies drastically from day to day--JaBistro's focus is on the utmost freshness. Presented on a stone slab and accented by cucumber shavings, and pickled vegetables and seaweed, the day's selection is sea breem, bluefin tuna from Halifax, ocean trout from Australia, and amberjack. 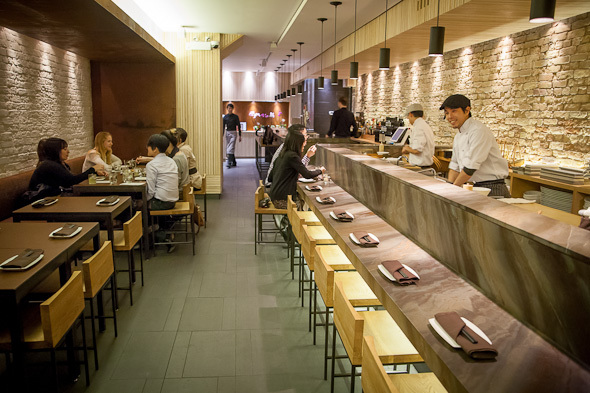 The last ingredient is raw lobster, whose halving (and slow demise) I'm afforded a front-row look at from my seat at the sushi bar. The meat from the tail is scooped out while the front of the lobster continues to quiver on the platter. Tashiro explains that this is done for freshness, and I'm aware that this is considered an elegant delicacy, but even I (who am hardly squeamish) was taken aback. That aside, the freshness of the fish is beyond reproach and flavorful enough that a splash of lemon and sea salt suffices. The restaurant also has a bistro menu of 10 items, which can be loosely described as fusion cuisine. 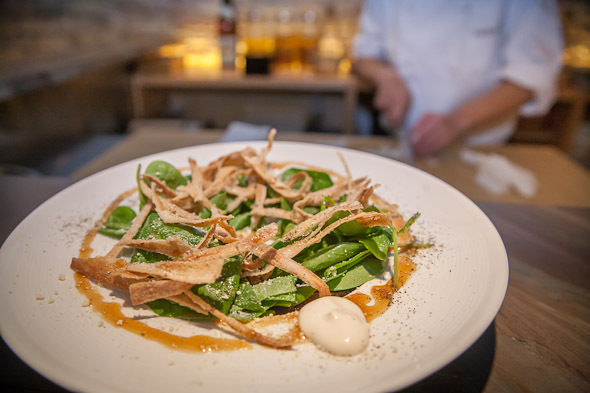 We try the kamo ($14), a thoughtfully arranged salad with an onsen tamago (boiled egg) in the centre, surrounded by duck breast, a nest of spinach leaves, dried burdock, and a dollop of house-made mayonnaise. I recommend trying the salad before piercing the egg, as the crisped burdock (used in traditional medicine as a detoxifier and diuretic) adds more than enough texture, and the subtle smokiness of the duck is somewhat overpowered by the egg. Next is the saba ($15), which is an oshuzushi topped with cured mackerel, made by pressing freshly-made sushi rice and the fish into a mould to obtain a perfect rectangle shape. Next, they're cut and heated from above with a handheld blowtorch. This not only imparts a different texture to the fish, but somehow allows its flavour to seep into the rice--we're advised to eat it without soy sauce, and the lush taste of the mackerel is more than enough. As you'd expect, the flavors here are delicate, well-balanced, and the dressings are made in-house--from the wasabi, which is made directly from wasabi root imported from Japan, to both a traditional soy sauce, and a house-made deviation made with fish broth and kumbu seaweed that yields a bit more sweetness. Tashiro even tends to the sushi rice by hand, in a large wooden bowl meant to absorb excess vinegar while retaining moisture. 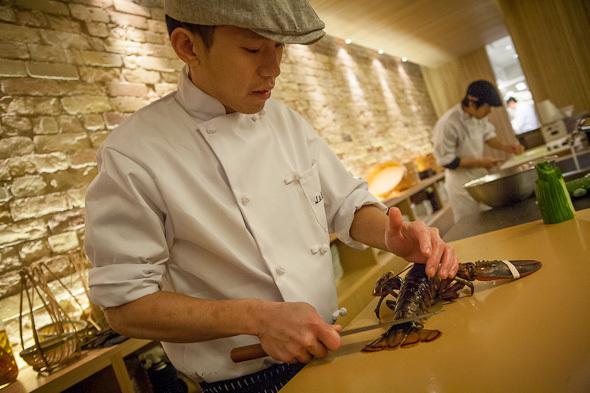 Although JaBistro's atmosphere is different from what we've come to expect from the Guu chain of restaurants, Kim is rapidly becoming a go-to name in quality Japanese cuisine. The addition of a lunchtime menu is set for December, at which time the dinner menu will also change slightly.